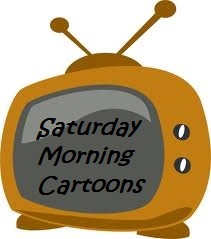 This week for Saturday Morning Cartoons, we’re taking a little journey with Disney into the annals of literature. 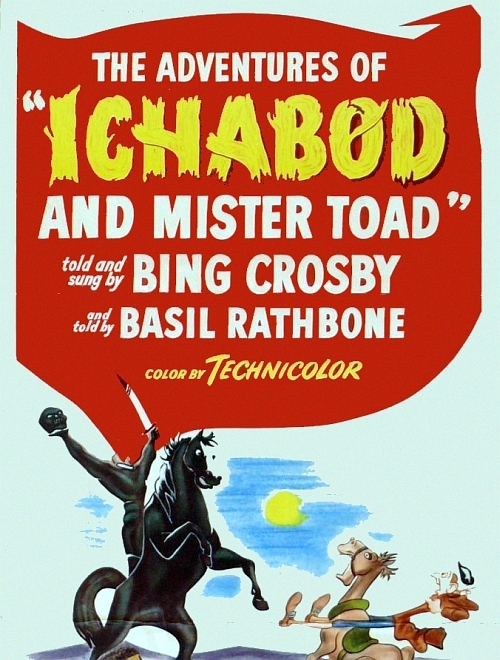 Released in 1949, The Adventures of Ichabod and Mr. Toad marks the final “package film” released by the Disney animation studios in the wake of World War II. A year later, Disney would be back in the business of full-length animated features with the release of Cinderella. Adventures relates two classic stories: The Wind in the Willows by Kenneth Grahame, and “The Legend of Sleepy Hollow” by Washington Irving. Both segments are narrated by Hollywood stars: Willows by Basil Rathbone (cinema’s preeminent Sherlock Holmes), and “Hollow” by crooner Bing Crosby. Willows tells the tale of J. Thaddeus Toad, a toad-about-town (so to speak) who, along with his loyal horse Cyril, lives for fun and excitement, much to the chagrin of his friends, Ratty, Moley, and Angus McBadger. When Mr. Toad’s wild life explodes into chaos and he is accused of stealing a motorcar, however, he quickly learns the importance of friendship and the value of other things in life … for a while, anyway. 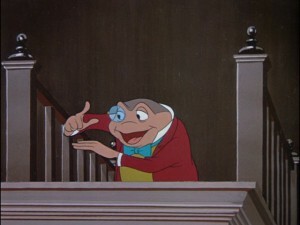 The Disney-fied version of the story changes Graham’s story by making Mr. Toad more hapless than deliberately wasteful, as he is depicted in the original. As per his usual, Disney takes the sometimes serious tone of Graham’s tale and adds a goofy sense of fun to better appeal to younger audiences. This doesn’t take away from the story, though–the spirit of Disney’s version, combined with some rather charming animation, makes this a highly enjoyable feature. The Willows segment gave birth to Mr. Toad’s Wild Ride at the Walt Disney theme parks–one of the original rides from the park’s 1971 opening–and this ride was the source of one of the most embarrassing moments of my childhood. When I was ten years old, my family embarked on our first trip to Disney World in Florida. When we went on this ride, my younger brother (he was six) and I rode in a cart separate from our parents. I’m not quite sure why, but the ride terrified the hell out of me. And when it broke down, I broke down. I screamed bloody murder for my mom and tried to get out of the cart to go find her before it started back up again. My mother was absolutely mortified when we finally came out of the ride and no less than fifteen employees were waiting to make sure I was okay. When I rode it again seven years later, however, I couldn’t believe I’d ever been frightened of it in the first place (it was dismantled the following year, so I’m glad I got to ride it one last time and see that it wasn’t really the stuff of nightmares, after all). But over the past few weeks, we’ve seen how truly scary some of Disney’s earliest films really were, so looking back now, I can’t say I’m completely surprised at my youthful horror. “The Legend of Sleepy Hollow” is both hilarious and frightening, and is a somewhat faithful adaptation of the original material. 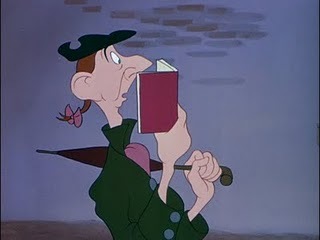 Ichabod Crane is a young schoolmaster who falls in love with local beauty Katrina Van Tassel. His competition for lovely Katrina’s hand is Brom Bones, the big man in town, who ridicules Ichabod’s odd appearance (looking, as he does, like a “scarecrow”). Brom frightens Ichabod by relating the story of the Headless Horseman, who is said to haunt the roads of town on Halloween. On his way home that night, Ichabod encounters the Horseman, and a terrifying chase ensues. 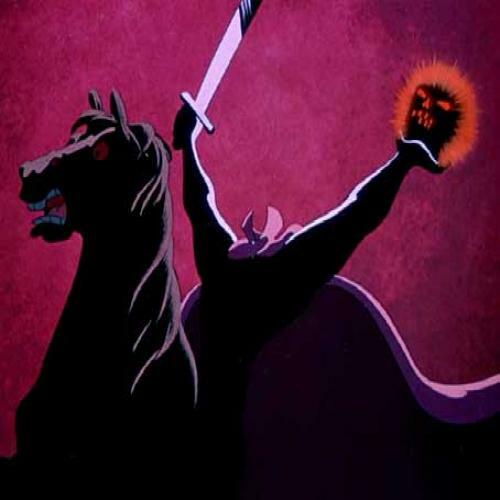 While the original tale makes it much clearer that readers are to believe that the supposed “Headless Horseman” is really Brom Bones in disguise, the Disney depiction of the legend is obviously meant to be seen in a more ghostly light. The addition of Bing Crosby to this segment is especially wonderful: that voice was just made for storytelling. In the years after its initial release in theaters, the film was broken up into its individual segments and shown separately in various venues. The movie was finally released in its original form on DVD in 2000. Many of the characters from the Willows segment, in the meantime, appeared in the 1983 Christmas short “Mickey’s Christmas Carol,” a wonderfully amusing adaptation of the Charles Dickens holiday tale. “The Legend of Sleepy Hollow” was featured as part of Disney’s Halloween Treat, which Nikki linked to this past Sunday. All in all, it’s a testament to the strengths of these segments that each one can be shown separately and still retain its unique, individual effectiveness. Thus we come to the end of Disney’s package film era. 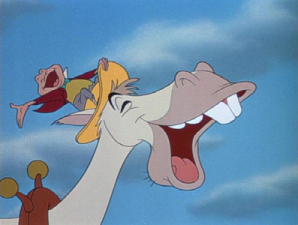 Later today, I’ll be posting an examination of Song of the South, one of the most controversial releases in the history of Disney animation. And again, next week we’ll be back to examining full-feature releases with 1950’s fairy tale to beat all fairy tales, the inimitable Cinderella. I love Icabod! I grew up with the version with the introduction by Walt Disney that has the history of Washington Irving. It’s actually because of this introduction that I chose to write about Washington Irving’s “Spectre Bridegroom” for a research paper in high school.